My previous post was about a Chibi doll I made that required large manga eyes. It was my first time trying that style, and since I had to figure out how to make them I thought it would be nice to share a tutorial to show you how I did it. It turned out to be very simple! Before starting on the eyes, I spent some time browsing through images of manga eyes to find a design I liked that would be easy to replicate with felt. My doll had black eyes so I used felt in the following colors: black, dark brown, and white. I also used scraps of black yarn to embroider the top edges. If your doll has blue eyes, use the blue instead of dark brown. You will need really good scissors to cut the felt, preferably small ones to cut the small pieces. 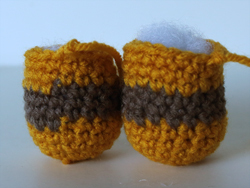 I bought two pairs at the craft store, one large and one small, and they come very handy! Cut two ovals shapes with black felt, the size will depend on the head. You can start with large ovals and cut them down until you are happy with the size. Mine were about 1.5 inches because the head of my doll was quite large. Next you will cut two small circles using white felt, and two rounded croissant shapes with brown felt. Finally, cut two triangles with your white felt for the corner of the eyes. Curve them at the bottom to fit the shape of the side of your eyes. Glue the pieces together (except for the white triangles). Glue your eyes to the head, then glue the triangles on each side of the eyes (I used a glue gun, it holds the pieces really well together). With a long strand of black yarn, embroider from top to side on each eyes just once. That is it! You can even glue some eyelashes to make her look even cuter. I hope you enjoyed this little tutorial, and if you have any questions don’t hesitate to ask me in the comments. When you change colors while working in rounds you usually end up with a zig zag pattern that doesn’t look very nice if you really care about details. That’s the downside of working in spirals, your row is not leveled with the previous one, and any change of color will show. There is another way to make your rows look seamless, and it is actually very easy to do. Here are two pieces I crocheted, one was done the basic way, the other one is seamless. The one on the right looks much better, obviously, so here is a tutorial to show you how to do it. Let, basic color change. Right, seamless color change. When you are ready to change color, just finish your row and fasten off (do not make a slip stitch). You will start your next row 3 stitches back from the previous row. 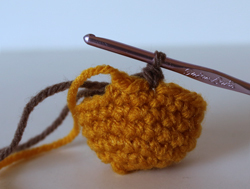 Make a slip stitch with your new color, then a single crochet in the same stitch. 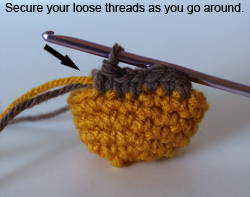 You can start hiding the loose threads behind your stitches as you go. 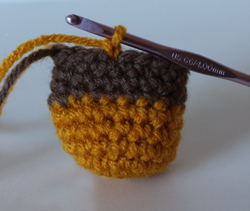 Continue to single crochet in rounds as usual until you are ready to change color again. Fasten off and repeat the same process from the beginning with the new color. That’s it! As easy as that. If you have any questions about this tutorial don’t hesitate to ask me in the comments section. Happy crocheting! 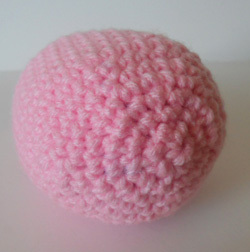 Here is a short tutorial to teach you how to embroider the extremity of an amigurumi part. 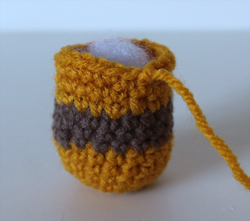 Amigurumis are worked in rounds that you increase then decrease at the end. Usually you end up with a small hole at your last row that you have to embroider to close up if you don’t decrease until your last stich. Here is the best way to do it, it leaves the extremity seamless and neat. You will end up with a lump that doesn’t look very nice. Instead of decreasing all the stitches of your last row, just decrease until you have 6 stitches left. fasten off and leave a long tail for sewing. 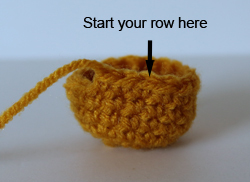 With a yarn needle, insert your thread in the front loop of your first stitch, and pull. Do the same with the remaining 5 stitches. Now pull your thread until the hole is closed up. All you have to do is hide the remaining thread by weaving it between the rows. This is a very easy method and I think the one that works best. I hope you enjoyed this little tutorial, and if you have any questions, don’t hesitate to ask me. Also if there are tutorials that you would like me to post, I welcome any suggestions. When I write amigurumi patterns, I always assume people know how to change color, so I only tell them what row they are supposed to do it, but not how. That inspired me to post this tutorial for crochet beginners who would like to learn how to do it. I hope this tutorial is comprehensive, I put a lot of pictures to help you understand the process. Assuming that you have to change yarn color for the next row, you will then do it while working on the last stitch of the previous row (amigurumi rounds are worked in spirals). In this case, we are doing it with single crochet stitches. 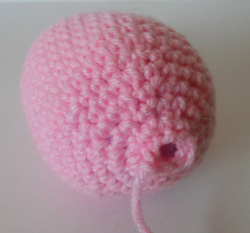 – Insert your hook in the stitch, wrap your yarn over it, then pull it through both loops of the stitch. 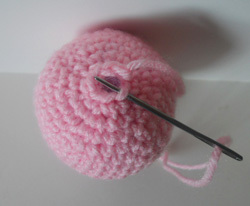 You have now 2 loops on your crochet hook. – Grab the yarn you want to change color with, fold it into a loop, and wrap it over your hook to draw through the 2 remaining loops in your round. 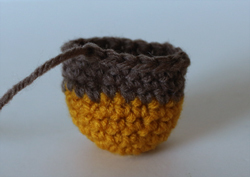 – Now you can cut the yarn you won’t be using anymore, but leave a long tail of strand (you are going to hide it within your next crochet stitches). 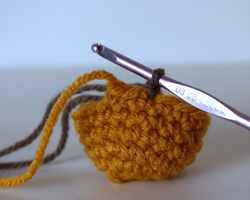 – Insert your crochet into the next stitch, and make a single crochet with your yarn over the two loose strands. – Once your loose strands are secured, just continue working your round normally. Another way would be to embroider the strands with a yarn needle after you finish your round, but I like doing it this way better. Voila! I hope you found this tutorial useful, and if you have any questions, don’t hesitate to comment. This is a very clever idea to make pompoms! So easy, but I would have never thought about doing it that way.